I love the improv split rail! A traditional rail fence quilt was one of my first quilts 31 years ago. I've had this book on my Wishlist for some time now! But to choose my favorite pattern??? I don't think I can! I love Modern interpretations of Traditional patterns. Right now I am dreaming of Clamshell quilts. Stars - anything with stars. I am addicted to them. Whether it is traditional or modern, it doesn't matter. That is a tough question. I would have to say modern. I love the look of something to catch your eye and a quilt that has a bit of "off" (no matching edges or something like that) makes your brain work to put it together. HA! I love your quilt! My favorite block seems to change with what I am working on (or not working on), but I am always drawn to star blocks. Being from Ohio (just up the road from you in Dayton), I will say Ohio Star! I think it would be the log cabin block because it's so versatile and can be either traditional or modern. I like the way you switched up the traditional rail fence. I'm currently hooked on churn dash, but that could change any time now! I love so many patterns, and lean toward a modern minimalist style. I gave up quilting 20 years ago because calicos were in then and I liked more primitive - 2 color quilts. My quilting group thought I was nuts! I've picked quilting back up with abandon now. I would LOVE the gift of your wonderful book. I'm really loving the new twirl pattern from Fig Tree. It's so fun to make those leaf blocks! Thanks for the giveaway! I am favoring Drunkard's Path lately since I am ready to attempt some curved piecing. I like Angela Pingel's twist on this block for a modern look. I don't know if I have a favorite pattern! That's so hard! I love triangles, though. I also really love the modern designs. Loving the hexagon/jewel/triangle trend and especially like Lotus by Jaybird Quilts for a quick and easy, yet complicated looking pattern. I love all kinds of quilts and have a special admiration for Baltimore Album quilts. What an amazing book. I love the Dresden plate quilts I have seen and would like to make one in repro 30's fabric. I like the Double Wedding Ring. I just made a rail fence quilt but yours is sooo much more interesting! My favorite quilt pattern is the traditional churn dash. You just can't go wrong with churn dashes! Thanks for the chance to win. I love log cabin, both traditional and wonky. I favor the churn dash block. I'm more of a traditional quilter, but interested in learning more about modern quilts. The more blocks and quilts I see from Michele's book I love the book even more. This may be just what I need to learn to create modern quilts. Right now my favorite is the log cabin block. There are so many ways to explore with that block, and yet it always harkens back to the traditional. Congratulations on another wonderful quilt--you seem to always come up with designs that please immediately but then invite further exploration. I love a log cabin block and pinwheels! thanks! My favorite is log cabin although I have done several version of rail fence in a modern arrangement. Love your rail fence quilt! They are so much fun to quilt in the negative spaces. My go to fav block is the churn dash. Keep up the great inspiration! I'm dying to make a modern flying geese quilt from my husband's old button downs--a fusion of traditional and modern! Flying Geese might have to be one of my favorites, although it would be hard to say it is my absolute favorite. I'll have to check this book out, it looks great! I love the common nine patch; for versatility you can find none better! Your modern rail fence is delightful! i love love love log cabins! HELLO, it is the Pinwheel Block! I like modern quilt designs. I like large scale designs that show off the fabrics too. My favorite quilt block is log cabin. I like both the traditional and modern versions. 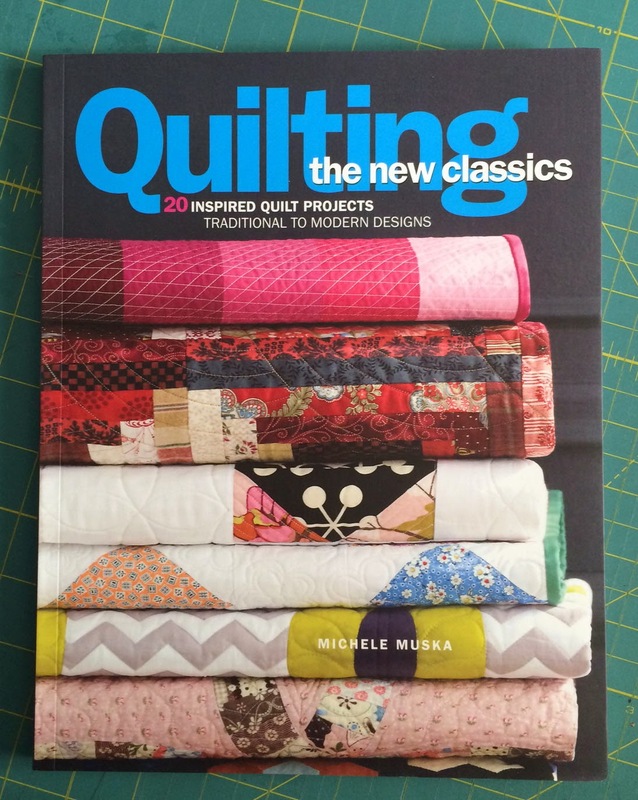 I think I would love this book -- I love to see modern quilts inspired by traditional blocks. One of my favorites is the Log Cabin block. Congrats on the book! I love the look of storm at sea quilts, but it's still a little too intimidating to try myself! Maybe next year!! I love log cabin with a modern twist. The book looks great! Thanks for the chance to win. HI, IT WILL ALWAYS BE THE "PINWHEEL" BLOCK! IT WAS THE FIRST I MADE+STILL LOVE IT! I love pinwheels, but as with anything I love, I hoard it and try not to use it too much. I have recently worked on several string quilts, making modified log cabins or just playing with color and sewing long seams. Then cutting and sewing again (the ultimate fate of a quilter)! My favourite pattern is New York beauty, but there are so many more that I really really like. While I don't have a favorite, I do love the log cabin pattern as it's so versatile. Also, it was the first quilt I ever made so it's bout time to do a new one. I might get some great ideas from this book! My favourite pattern isalways the oneI am currently making. Just now, that is a disappearing four patch! I love modern quilt patterns for sure! I am a lover of modern quilt for sure! I am IN LOVE with your modern twist on the rail fence quilt! That is just the design I need for my son...perfect! I love stars made from half-square triangles. I love the modern stars quilts. Thanks for the chance. Modern quilts are my favorite. I'm new to quilting so dont know all the correct names yet, but I do also like the modern ones that use traditional techniques. I like hexagons and flying geese and appliqued hearts in interesting fabrics, and Parla's pinwheels by Barbara Cline. I'm really drawn to traditional blocks set in an unexpected and non-symmetrical way. I love New York Beauty. I don't have favorites but I always come back to Granny Squares blocks and any star out there. I am in awe of a person who designs quilts! I am so new to the quilting world that I don´t even know if I like modern or traditional. But I guess modern is easier, so that´s what I like, right? Right? LOL! Thanks for the giveaway! The pinwheel is my favorite block. This book looks fabulous! Thanks for the chance to win it. I'm more of a traditional quilter though I do love some of the new modern patterns. New York Beauty is my favorite block. But I love the traditional blocks like Dresden Plate and Pickle Dish too. I am leaning more towards the modern slant -- it's hard for me to let go of traditional, but I'm learning! Thanks for the chance to win! Have to say I love stars as well! I love any kind of pinwheel blocks. Thanks for the giveaway! What an amazing book and would love to win a copy! I'm partial to star blocks, anykind and they look great traditional or modern. Thanks for a super giveaway and a chance to win. So far during this blog hop I have fallen in love with two modern quilts - the Hexie quilt is awesome, and the Mama Bear Baby Bear quilt is also awesome - I love them both. I think the negative space in modern has always intimidated me but now I am seeing a lot of straight line - or almost straight (a little intentionally wavy) line quilting - which I could actually accomplish with a walking foot - so I am more attracted to modern because of that. I have tried free motion quilting once and was rubbish at it - I do hope to try it again - someday. I love log cabin with current modern fabrics! My favorite quilt pattern is pinwheel or churndash or log cabin or Dresden plate ... depending on where the spirit moves me. Love bright colors also. This book looks great! I don't know that I could pick just one pattern, but I love everything that Elizabeth Hartman puts out. Thanks for the giveaway! Love Log Cabin, and making it modern is fun! I like nature inspired blocks, leaves and twigs. I have been making quilts that are inbetween modern and traditional... I think I need to step outside my comfort zone, and this book looks awesome for exactly those types of projects!! Hoping to win!! Hmmm, I love lots! Probably the log cabin, but maybe flying geese and HSTs. thanks! Wow the modern rail fence is a great design. I can see this done in awesome stripes, too. Rail fence was one of the first quilts I made. What a wonderful book. I am a traditional kind of girl. Congrats on being in the book. Love your take on rail fence! My favorite block is probably log cabin, but you are making me look at other blocks differently! I have no idea what color dogwood might be, but I did enjoy seeing your modern version of the traditional block. Thanks for a chance to win the book. And thanks for not having the embedded comment block that so many of us can't use! I'm loving modern quilt patterns (though I do love a modern take on traditional patterns). I love modern quilt patterns! Dear Jane is my favorite. The border is great, and the sampler nature is neat too. I like the double wedding ring the most. Modern is growing on me! I have been doing a lot of the slab type blocks, which are a modern variation of the log cabin. I'd love to win this! My favourite pattern is Birds in the Air. Hmm, now to modernize it! I'd love to try the modern versions of these quilts. They're amazing! And anything that's a simple block--since I'm still learning:). I love your split rail design! I love the friendship star block or any star!